This photo is taken from the stage at last month’s Lightning Bolt show at Ridgewood Masonic Temple and fairly portrays the crowd and the music that night. We’ve previously posted the Dan Deacon set, but this Lightning Bolt performance was a challenge — the recording has some technical issues that needed to be resolved, and we frankly didn’t know what to make the performance itself. Its very hard to describe Lightning Bolt. The common moniker “noise rock” does not really describe anything they do. While drummer Brian Chippendale wears a mask (see photo) that holds an amplified telephone mouthpiece for vocals, he is accompanied by Brian Gibson’s aggressive bass that sound nothing like a bass guitar. Lightning Bolt does not play conventional songs, nor are the songs played the same way twice. 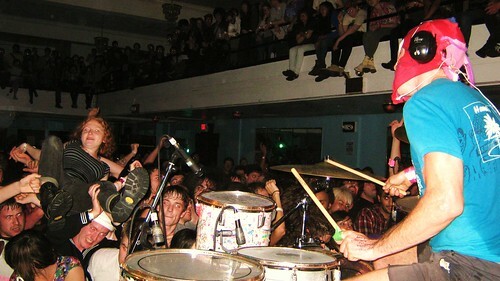 Although the band is noted for leaving the stage and playing from within the crowd, on this night in Brooklyn Lightning Bolt remained on the stage for their hour-long set. The setlist is consistent with other recent shows and includes songs from the last two albums and some new material, perhaps for a planned followup to 2009’s Earthly Delights. I recorded this set in the same manner at the Dan Deacon set. The audience mics were placed at the rear of the venue in front of the soundboard area, and near the back of four speakers. The soundboard feed for this particular set was marred by inconsistent levels on the drums, and the last half of the feed was excluded entirely due to overamplification of the snare drum. The levels of the set were made consistent and some severe peaks were softened. The final result is a very listenable recording. Enjoy! 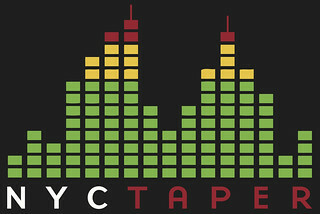 If you download this recording from NYCTaper, we expect that you will PLEASE SUPPORT Lightning Bolt, visit their website, and purchase their official releases from the Load Records website [HERE].